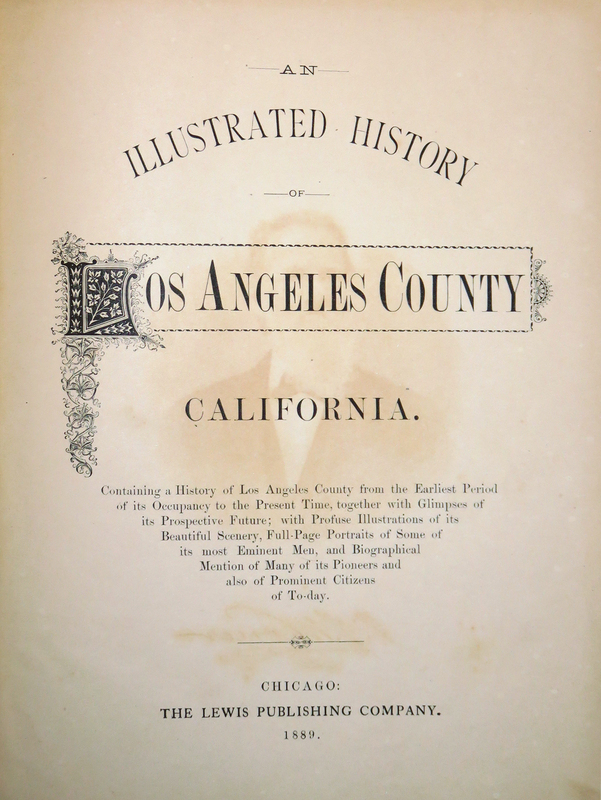 SCVHistory.com | SCV Pioneers | John Lang: Biography During Life, with Bear Story (Pen Pictures L.A. County 1889). An Illustrated History of Los Angeles County, Calif.
Chicago: The Lewis Publishing Co., 1889, pp. 539-540. This pay-to-play "article" from 1889 is the reason several false legends grew up around the grizzly bear John Lang hunted down in 1873. The bear did not weigh 2,350 pounds. By Lang's own account, it weighed 1,600. It was not named "Monarch of the Mountains." Monarch was a generic term for all grizzlies; the bear popularly known as "Monarch" was captured in 1889 by one of William Randolph Hearst's reporters and put on display in San Francisco where it died in 1911. It was Hearst's bear that modeled for the state flag. Was Lang's bear pelt sent to a museum in Liverpool? Maybe. Finally, the date is probably wrong. Lang might have set out on his hunting expedition July 7, but it wasn't 1873; he bagged his bear July 15, 1875. JOHN LANG is a native of Herkimer County, New York, born May 5, 1828, and is a son of James P. and Lucy (Rarick) Lang, the former an Irishman by birth and the latter of Mohawk-Dutch extraction. James Lang located with his family in Waterloo, Wisconsin, and followed farming and the dairy business; reared a family; and there died. He had four sons and two daughters, of whom the subject of this sketch is the third. He left home at twenty-one years of age; taught school successfully for a time; also acted as salesman in dry-goods houses for several years. He subsequently engaged in merchandising on his own account in Rochester, Wisconsin. Later he took a situation as tutor in Todd's Seminary and Camden Point, Missouri. In 1854 he crossed the plains to California, by way of the North Platte, entering the Golden State on Dry Creek, thirty five miles north of Marysville, where he spent his first California winter. The following spring he went to Sacramento, opened and operated two hotels, the Tremont and the American, for about one year. He then located to Martinez, California, and engaged extensively in the dairy business, and there made the first cheese vats in the State, in the spring of 1856. In 1862 he moved to Virginia City, Nevada, and was one of the leading pioneers of that section. Owing to the ill health of Mrs. Lang, he was compelled to sell his property there, which he did at a heavy sacrifice, and returned to California. He then located on thirty-five acres of land now comprising the Washington Gardens, where he cultivated grapes, oranges, olives, etc. He also spent two years in the San Gabriel Valley, and manufactured cheese on the ranch of Hon. D.B. Wilson. The profits of this business venture netted him $25 per day. In 1870 he purchased 160 acres of land, forty miles north of Los Angeles, on the Southern Pacific Railroad, paying $300 for the same. This he has since developed into one of the finest estates on the line of that thoroughfare. Lang's Station, Lang's postoffice and express office are there, the results of his enterprise. He also owns the valuable Sulphur Springs at that point, and the Sulphur Springs Hotel. His ranch now comprises 1,200 acres, devoted to diversified farming. It is finely located and the improvements are of the most attractive and modern character. In connection with the life of Mr. Lang, we noted that in 1873 he killed the great bear that was known as the Monarch of the Coast. This bear was for over thirty years the terror of California, as he roamed over the entire State and proved invincible against all the many plans invented to capture him. Many human beings fell before him, and by his cunning hundreds of cattle, sheep, hogs, etc., were mowed down in his wake. But on July 7, 1873, Mr. Lang made up his mind that this outrageous and ferocious brute had spilt human blood long enough; hence he took his trusty gun and followed his trail for about twelve miles into the San Fernando Range of mountains, in Los Angeles County, and there came upon him. The brute at once started after him with a scream that made the mountains ring for miles away. Then the battle for life began, for it was only victory that could save either, as escape was impossible. But Lang, knowing his gun, waited for the mad brute until he came within thirty feet, then aimed for the sticking lace in the beast, and the infuriated champion bear fell to rise no more. His weight was 2,350 pounds; size of foot, ten and three-fourths inches in width, and nineteen and one-half inches in length. The hide is at the museum in Liverpool. It was the largest grizzly bear ever known. Mr. Lang was married May 3, 1862, to Mary E. Floretta. They have three sons and two daughters living, all at home. The Lang estate is valued at about $50,000. Webmaster's note. Text has been divided into paragraphs for ease of reading; it's all one paragraph in the original. Otherwise unaltered.